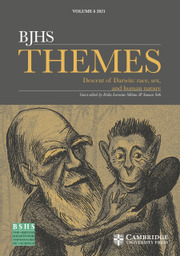 BJHS Themes is a collaborative venture between the British Society for the History of Science and Cambridge University Press aimed at establishing the first fully open access journal for the history of science community. It aims to publish open access, scholarly and engaging collections of history of science papers, which address provocative themes, and which will be free for readers and offer no financial barrier to publication for authors. Like its sister publication, British Journal for the History of Science, BJHS Themes is a journal of the British Society for the History of Science, a major learned society for its subject.